There is a telling article in Iran’s State media this morning, “Funeral held for Iranian General Martyred in Iraq“. 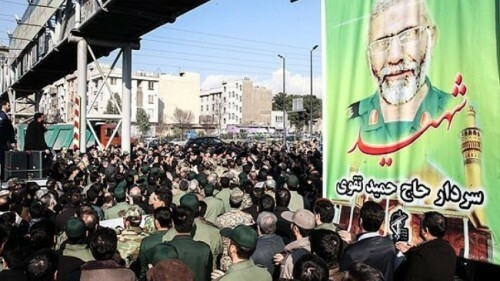 A large procession honored Revolutionary Guards Brigadier General Hamid Taghavi, who was a commander in the 1980-1988 Iran-Iraq War, while he was “an advisory mission” in Samarra, 110 kilometers (about 70 miles) northeast of Baghdad. The exaltation of Taghavi’s sacrifice points to an Iranian campaign to proclaim its salvation of Iraq from the offensives of the Islamic State — and at the same time dismiss the intervention of the US against the jihadists as ill-conceived and ineffective. In sharp contrast to attempts to hide the deaths of Iranian personnel in the crisis in neighboring Syria, Tehran wants international attention to the presence of its elite commanders in Iraq as “advisors”. Since the summer, the Iranian media have spread images of General Qassem Soleimani, the head of the Qods Forces of the Revolutionary Guards, in Iraq and portrayed him as the saviour of the Iraqi defense against the Islamic State’s rapid advance towards Baghdad. That portrayal is part of a wider campaign, at home and abroad, to sway opinion. Last week’s Tehran Friday Prayer assured worshippers that Iran would protect Iraq’s shrines, such as the two mosques in Samarra. Meanwhile, Speaker of Parliament Ali Larijani was on a high-profile tour that included meetings with Iraqi Prime Minister Haidar al-Abadi and Iraqi Kurdistan President Massoud Barzani. This morning Press TV accompanies the image of Taghavi’s funeral with Larijani’s declaration, “It was the Islamic Republic of Iran which stopped the advance of the savage terrorists in Iraq and established peace in that country,” adding that “Tehran’s military and advisory assistance to Baghdad came at Iraq’s request”. In contrast, “the western coalition to fight the ISIL terrorists is merely a political gesture in the world and they don’t do anything in practice,” Larijani said. Meanwhile, Shamkhani announced that the Iranian “consultations” prevented the fall of Baghdad and the Iraqi Kurdish capital to the Islamic State. Shamkhani asserted that Iran’s advice “broke the back” of the jihadists. At the same time, the US-led coalition has been “ineffective” in an intervention which “serves other purposes than uprooting terrorism”. Iraq’s Defense Minister Khalid al-Obeidi arrives in Tehran on Monday for talks on “security cooperation and coordination”. Insurgents have killed three Revolutionary Guards personnel in southeast Iran near the Pakistani border. 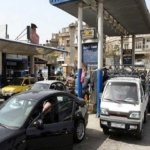 The Guards announced Monday that Major Akbar Abdollahnejad, 3rd Lieutenant Qodratollah Maandani, and Mousa Nasiri Bayat had been slain by “armed outlaws”. Since summer 2013, the Sunni insurgency Jaish ul-Adl has carried out a series of attacks, including assaults on border posts and kidnappings, in the border area. The Iranian regime has begun its proclamations of victory over mass protests for rights and reforms, following the disputed 2009 Presidential election. On December 30, 2009, the regime organized a large counter-rally, three days after demonstrations pushed back security forces in Tehran. The day will be eternal as a golden page in the history of the Islamic Revolution; it is a day when the devotees of the Revolution and the Leader of the Islamic Republic consolidated their spiritual relationship with the leadership of the Revolution; it is a turning point, and a day of honor and prestige for any Muslim man and woman; it is a symbol of independence, national pride, and the covenant of a people whom resisted with their lives to defend the principles of Islam and ideals of the Islamic Revolution and Imam Khomeini. PreviousSyria Daily, Dec 28: Has Assad Regime Used Napalm on Civilians in Homs?